I bought that H&M necklace some time ago and it's already one of my fav pieces this summer. That jacket is so cool! Great purchases :). 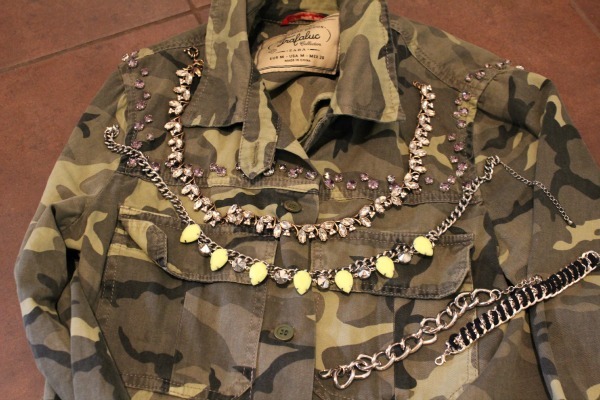 I have the necklace with the yellow stones, really spices up a simple outfit, love that! love the jacket and the necklaces! Love everything in this post, especially the necklaces! The neon one is so pretty! Great jacket, and the neon necklace from H&M is so pretty! Wow, die Jacke ist traumhaft schön!!! love this necklaces and also your blog! It's so nice!!! I follow you! LOVE ALL DEAR!i need that shirt!! PS: I just started a giveaway! Visit if you want to win the amazing bobbi brown book! Die Jacke ist sooo toll!